When we open our hearts to life our hearts inevitably will be broken by life. Our hearts will be broken for lost love, for friends and loved ones who die, for children who grow up and leave home, for flowers that wilt, for cultures, places and critters lost from the planet, for the violence perpetrated by one human on another, and for the hope that lives on in spite of loss. Life is wrought with heartbreak. We keep opening our hearts so that we can experience love and joy knowing that everything passes in time. Heart opening postures support the body through the process of grief. They help us feel safe when we are exposed. They let us know that we can care for ourselves in vulnerable situations. When we practice heart openers we experience the physical sensation of an open heart without breaking. Difficult emotions may arise in these postures. Breathe through the emotions. Let them in and don't grasp onto them. Always breathe and let them pass through you. Backbends can be done standing, seated or lying on the floor. There are belly down and belly up variations. Begin simply. Try sprinkling the seated and standing variations pictured above throughout your day. Invite your heart to lead and your gaze to turn gently up. These poses will counter the habitual forward bending we do in our lives. You'll feel better at the end of your days as a result. Bridge pose is a larger heart opener that is accessible to most bodies. It is contraindicated for those with neck injuries. Seek help from a qualified teacher if this pose causes you any neck pain. To begin: Lie on your back on the floor with your arms along side you, your knees bent and your feet parallel. Notice the presence or absence of a lumbar curve, the space between your low back and the floor. Beginners may choose to practice low bridge and pelvic tilting: alternately press your low back into the floor with your exhale and let the low back rise with your inhale. Keep your sitting bones on the floor for this variation. The core all back bends is the arching of the spine towards the front of the body and the lifting of the heart into the front of the awareness. After practicing pelvic tilts find 'low bridge:' the position where your buttocks and shoulders remain on the floor while the back is arched toward the ceiling. Engage your abdominal and back muscles here to support your lumbar spine as you press your feet into the floor and lift your pelvis upward into bridge posture. Continue to open the front of your spine, lift your heart toward the front of your body and maintain strength and support in your pelvic floor and abdominal muscles. 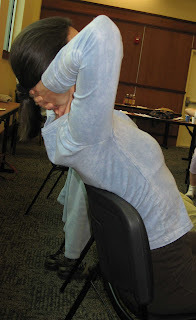 You can work with the arms alongside you or clasp your hands together on the floor under your pelvis. In either case press the arms bones firmly into the floor for additional support. Hold the pose for three to five long smooth breaths. You'll want to repeat the posture about three times. There are two common ways to come down from bridge posture. You may reengage your supporting muscles and lower your back to the floor while you maintain the arch of the low back thus bringing the sitting bones to the floor before the low back. This method improves low back and abdominal strength. Alternately, you may slowly drop one vertebrae at a time to the floor from your upper back to your tail bone. This method improves spinal articulation and mobility. Both are good. For times of deeper grief or when you need restorative rest choose a supported variation of bridge posture. Lie face up on the floor with knees bent and place yoga blocks, folded blankets or a firm pillow under your pelvis. The basic form of the pose is the same and you can release the work of the pose and relax into gravity. If it is comfortable on your shoulders you can let your arms rest in 'cactus' alongside the head and place an eye bag on your eyes and forehead. Remain in supported bridge for five to ten minutes or as long as your low back is comfortable. The goal of heart openers is not to avoid grief. Rather, to be present for grief, to accept grief, and to weep. Then to wipe your tears away, stand up and embrace life knowing that the more deeply we fall in love the more opportunities we will have to grieve. And the more fully we grieve our losses the more deeply we can fall in love.